Could a rookie kicker taken in the fifth round be one of the more important Miami Dolphins this season? Certainly. 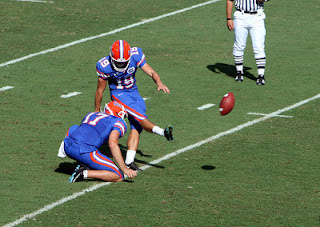 Kicker Caleb Sturgis from the University of Florida will battle Dan Carpenter this offseason for the team's kicking job in one the more intriguing yet largely untalked about position battles. As Dolphins fans have learned over the past few years, the kicker position is important. A former Pro Bowler, Dan Carpenter has been inconsistent at best over the past three years and perhaps even more surprisingly, has battled injury. Carpenter went 22-for-27 last season and hit a game-winner as time expired against Seattle, but in recent history, Carpenter has not been there when the game was on the line. His 81.5 field goal percentage last season ranked just 24th in the NFL and he was just 2-for-5 from 50 yards and beyond. And in a season in which the Dolphins stayed in the playoff race until Week 16, he had an opportunity to win games early in the season that ultimately resulted in losses. In Week 3 against the New York Jets, Carpenter missed a pair of field goals including a game-winning attempt in overtime as the Jets knocked off Miami 23-20. Carpenter also missed a kick the following week at Arizona which would eventually result in a 24-21 overtime loss to the Cardinals. Carpenter even had an 0-for-4 effort in a 17-14 home loss to the Buffalo Bills back in December of 2010. But beating out Carpenter won't be easy for the rookie from Florida. A two-time Lou Groza Award finalist, Sturgis has battled injury himself, but has been solid during his Florida career and possesses a big leg. As a senior in 2012, Sturgis was 24-for-28 on field goal attempts, a perfect 3-for-3 from 50 yards and beyond and 9-for-10 from 40 yards out and beyond. His 85.7 field goal percentage last season was more than four points higher than Carpenter's and that's with wider hash marks in the college game. Both guys have big legs, but over the last two years, Sturgis has been more consistent. Last season, five of Miami's nine losses were decided by a touchdown or less and there will likely be a lot of close contests this season so having a good kicker is necessary. Carpenter has had a solid career with the Dolphins, but has come up short in critical situations in recent history and it's time the Dolphins move forward with a new face. With a career-long of 56 yards at Florida, Sturgis certainly has the leg and ability to thrive in the NFL. And if Sturgis is the guy, he will certainly be faced with some critical situations, but those are situations where Carpenter has not thrived in recent years. Teams play close games every week in the NFL and if the Dolphins are to make the postseason for the first time in five years, they're going to need a reliable kicker.